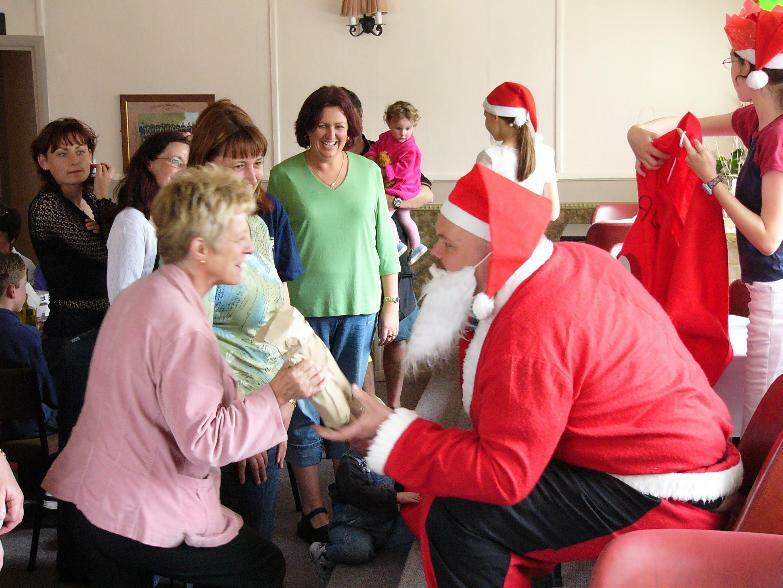 This page provides brief descriptions and photos from 2004 club events. 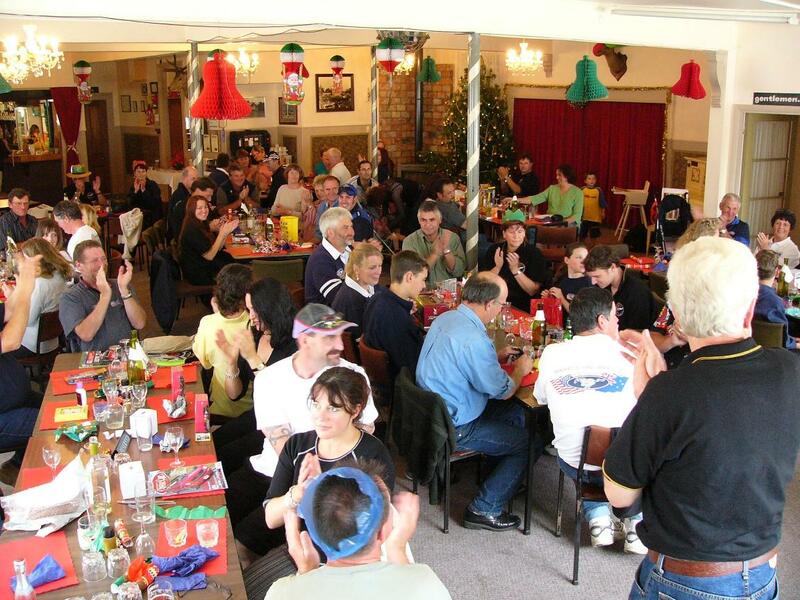 In keeping with the rest of the season so far, it wasnt exactly a gloriously warm summers day, but never-the-less there was a a great turnout at Te Kowhai centre in Levin for the Club Xmas bash. It would be fair to say that this was a particularly enjoyable and fun meeting, and a great time was had by all. Here are a few pics I took on the day in case you were unlucky enough to miss it! A club mustang featured in Wellingtons annual Xmas parade on November 21st. Rick Lewis pulled off the big one and got to transport Miss NZ along the parade route in glorious sunshine, to maximum crowds. This fabulous set of Cobras was arranged by Trish Jefferies for her son Dean's wedding in Feilding on Nov 6th. The cars belonged to Trish & Bruce Jefferies, Gregg Watts, and Mark & Ange Beel. 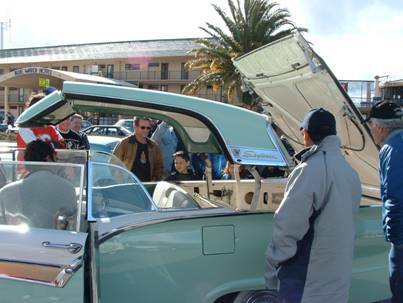 Trish said: "Perfect weather helped the cars create somewhat of a stir in the town, and I'm sure some people were thinking they needed their eyes tested. I was also able to get the Manawatu Standard involved, and they did a write up about the cars/wedding, which would have informed a lot of people about what they had been looking at. Quite a bit of organisation went into the day, which went off very well indeed. The official photographer said he took double the amount of photos and that was due to the cars. Everyone agreed they looked stupendous. Sincere thanks to Ange & Mark and Greg Watts without whose input the day could not have happened." Event report by Charmaine Scott. This meeting was set down as another attempt at holding the club’s Show’n’Shine contest, along with a fun day of games, like piston-throwing and precision-driving onto a plank. The Wanganui members who organised the day decided that Springvale Park was too soggy for our usual “games”, so we moved to Virginia Lake, a gorgeous picnicking spot. We were handed a list of questions and a loaf of bread and sent off, on foot, round the lake. The loaf of bread was to lure ducks, because we each had to collect a duck’s feather. Unfortunately, the ducks have seen this trick before and, furthermore, seem to be bored with bread, because there were quite a few uneaten slices already floating in the lake. It was good fun and there was a fair bit of cheating and misleading going on, but at least no one fell or got pushed in, and we all found a feather. Chris Stone got the most correct answers and was thus deemed the winner, taking home a fine trophy. The club awarded chocolates to runners-up Lance Peacock, Ange Dewsnap and Charmaine Scott, argest Feather finder Roslyn Barrett, and to Eileen Bensemann, for her effort in providing about 40 answers to the 12 questions. After our picnic lunch – our hosts generously provided delicious quiche and muffins too - we had our club meeting, then the Show’n’Shine trophy was (at last!) awarded. There was only a 1-point difference between first and second places, so the club gave a prize to the runner-up as well. John Camm took home the trophy and Roslyn Barrett got second place. It was noted that the same person had painted both cars. Because we could be seen from SH1, we had steady stream of visitors, like some so-called boy-racers who wanted to know how we got the cars so shiny, and the most unusual caller, a couple in a 1906 single-cylinder chug-a-lug, who puttered up to say hello and who were immediately surrounded by nearly everyone present. Seems it doesn’t matter what era, car enthusiasts can appreciate them all. Well, most, we’re not sure about Robin Reliants. 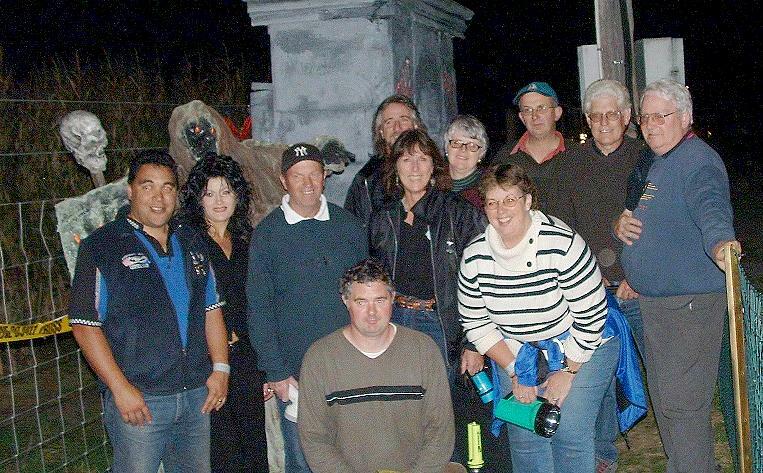 The Wanganui members, especially Cindy and Kelvin Coley and Bruce and Sonya Hodge, went to a lot of trouble to make us feel welcome in their hometown, and put on a really enjoyable day for us. They even managed to score perfect weather! We’d been trying to organise a meeting in Hawkes Bay for a while, but several factors meant we hadn’t got there. 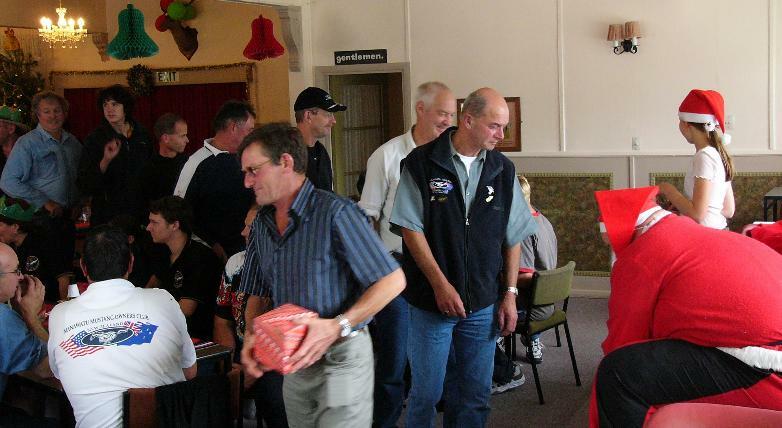 So why not hold an “unofficial” club get-together for Hawkes Bay members, especially as we’ve had quite few join from up that way in recent months. 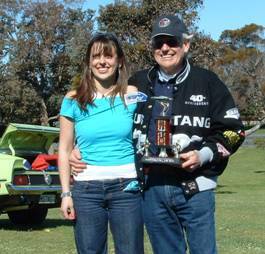 Committee member Brian McLeary (who sold his Mustang to buy a T’Bird, but we don’t hold that against him. We figure it’ll get the better of him in the end and he’ll have to get another Mustang) organised a day and got hold of locals – members and non-members alike – to invite them along. A couple of us travelled up from Wellington to join in. We were expecting typical Hawkes Bay weather and we got that half right. It was fine and blue, but had the sort of cold (very) wind we thought we’d left behind. 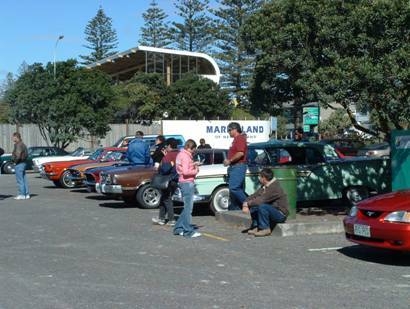 We started the day in the public car park on Napier’s Marine Parade, where Mustangs kept arriving in ever-increasing numbers. In the end, there were 23 parked up and Brian was looking terribly worried about whether the lunch venue could cope with so many of us. We had a great time checking out the cars and meeting their owners: there was a car that had been on the road for a day, another that was newly-purchased and at the other end of the scale, a couple that had been in the family for nearly 20 years, one of those a daily driver. 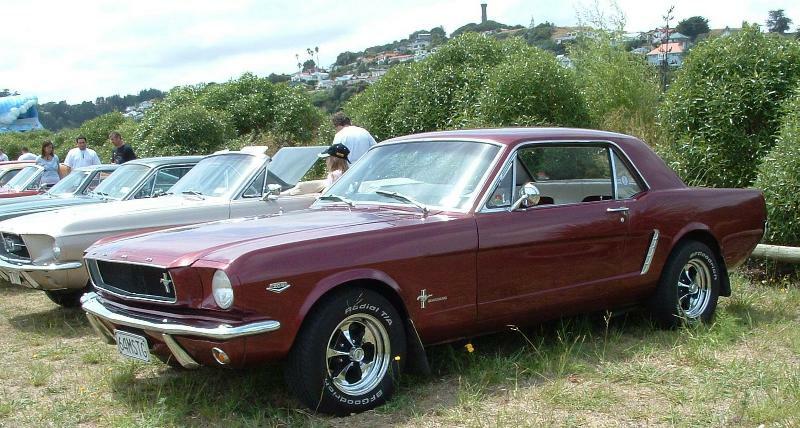 Brian’s original plan was to cruise up to the lookout, but those who know that bit of road will realise that so many of us would just cause an unhappy gridlock, so we cruised to Hastings and back instead, taking in the sights and enjoying being in the midst of a line of Mustangs. The lunch venue, the Bluewater Tavern, coped very well, considering there were nearly 50 of us wanting lunch at the same time. We sold all the club t-shirts we took and most of the MMOC 25th anniversary badges. These people were in the mood to shop, so we’ll be better-prepared next time. Fittingly, Brian won first prize in the raffle, a really cool t-shirt we got from Southern Mustang. After lunch we were treated to the display of a Skyliner Hard-top turning itself into a convertible at the touch of a button. Everyone agreed these “regional” meetings are a good idea and that we’ll do more of them. The Taupo contingent are already planning one and we’re keen to come back to Hawkes Bay, too. Maybe next time they’ll put on the sort of weather they’re famous for. 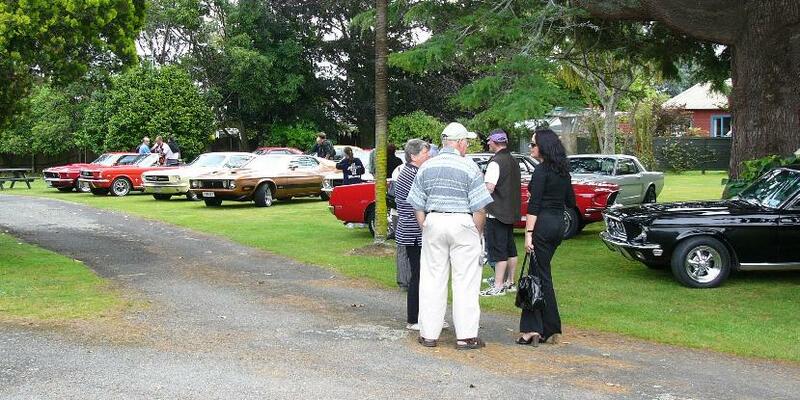 25 Mustangs (and the usual small assortment of ‘other’ makes) came to this meeting –an opportunity to check out Palmerston North’s Saker Cars and, later, Resto Spares. We were hoping to hold the annual Show’n’Shine, postponed from last month, but the dreadful winter weather meant no cars would arrive clean, so we flagged it away again. The Wellington-Kapiti Coast convoy arrived on time for coffee at the designated McCafe, but not in time for most of us to get a park, so we filled up surrounding areas as well. I thought it was exceptionally brave of a couple of Boss owners to park in there, actually. I wouldn’t and we haven’t even got a Boss. Coffee and muffin-fuelled, we set off for the next stop and it would seem that a few didn’t know where they were supposed to be going, judging by their desperate attempts to not be left behind at red lights. 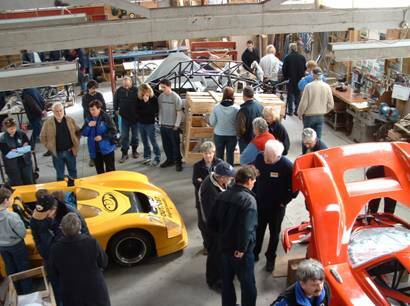 At Saker Cars the custom, hand-built race and road cars were fascinating and you could see a few Mustang owners wondering how they might apply some of the technology to their cars. They might like to think about keeping the garage as clean and tidy as this one was, too. Well, not after we left, we’d all tracked so much mud inside. Next stop was lunch at the Rose and Crown and the club meeting. The Rose and Crown donated two bottles of wine to the club – thanks guys – probably for making their car park look so good! Continuing appalling weather meant not too many attended this meeting, although the weather cleared up at the last minute, contrary to the forecast. The same couldn’t be said for the temperature. 13 Mustangs (and a few members’ civvy cars) parked at the Skyline Restaurant and, after a fine coffee to warm us up (we like our coffee in this club), we wandered up to the Observatory. We were treated to a Planetarium talk and display – most of us actually learnt something, too, like that The Pot (Orion’s Belt) is actually only visible in our skies in summer. Scorpio is the easy one to find in winter. Then we wandered round looking at astronomical instruments – some in both senses of the word; the 1867-built telescope looked more like part of an old steam locomotive than a fine and precise instrument. After lunch at the Skyline and our club meeting (at which the President distinguished himself – again – by winning an indecent number of raffles, but graciously returned second prize when he won first prize too, only to re-win the second prize!) we decided to do a cruise through Wellington and around the coast to the famous Chocolate Fish Café. Well, it all went astray almost immediately when the people at the front hadn’t heard the intended route, so led us in the direction of the most traffic lights, which meant that we got split into several packs. When our posse got to the café we seemed to be in a lonely group of three. Turned out the rest of them were behind someone who didn’t know to park before they got to the café. Of course, once they saw it, it was too late to park and too hard to turn round, so we believe they ended up at Island Bay’s The Bach, although most carried on cruising home, no doubt to turn all the heaters on. The weather forecast for this meeting was about as bad as it could be, so many of us left the stang in the garage and headed over to Masterton's Burridges cafe (same place as last year) to brave the forecast wind and gales in our daily drivers. The rain was there alright, but fortunately the gales were a no show till after the meeting. There was a good turn-out of perhaps 60 people, but only 18 mustangs. The meeting began at 11 am with the usual social interaction. At midday the club provided an excellent free lunch before the AGM began. This meeting marked the start of the clubs 25th Anniversary year, and special pins have been made to commemorate this. The proposed club constitution was adopted by an almost unanimous show of hands. The majority of the existing club executive was then re-elected unopposed. 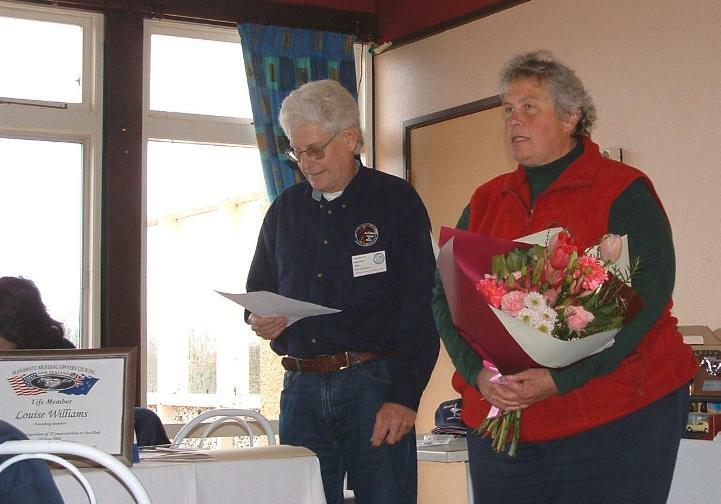 Louise Williams as the sole remaining founding member was honoured by the club with a life membership. She was also presented with flowers and a huge and well deserved applause from those present. Keith Robinson distributed an excellent treasurer's report, and was appropriately commended. It was proposed that club sub's be increased to $40 next year to help stave off ever-rising costs and this was supported by a clear majority. The Editors trophy was awarded to Dale Such, and the Gene Thomas Memorial Trophy for attendance and presentation was won by Mike Hampton. Rick Lewis as re-elected Sheriff duly doled out a range of fines including to "yours truely" for mentioning in the last event report that he used some Avgas in his car. The meeting ended at 3.30 pm after a 20 min PowerPoint slide presentation from Wal, outlining the events, cars and scenery from the Great NZ Mustang Run. Louise thanks the club after being presented with her life membership. This was my first run in the Boss since the 3,300 miles done in the GNZMR. With a 1/3rd tank of avgas and the rest 98 Octane the B9 was running beautifully, reminding me how well the cars respond to being used regularly. The weather wasnt too warm, but at least the rain did hold off for the day. Arriving too late at the usual meeting point in Upper Hutt we zipped over the hill, paused at the Featherston Railway Incline museum to show our visitors the train, and on to Martinborough. Here we found at least a dozen stangs already parked up in the town square. There were no owners readily apparent, so we wandered off into the "cafe district" for lunch. No sooner had we sat down than other club members came wandering past and soon we had meet almost everyone. Tums filled it was back to cars and off (after two circuits of the town square) to the Mystery destination. This proved to be the wind turbine farm just 20 mins away on the hills nearby. The viewing point is worth a stop, and you can see 6 of the 7 machines. Some specs: 500 KW output, 20 m blade length, 250 tonnes of concrete in the foundations, and mounted on 40 m high towers. The southerly wind was fairly brisk on site, so after a 15 min stop it was off to a more sheltered and hopefully warmer location. After a deviation to do another circuit of the town square (! ), we arrived at the Murdock James vineyard about 5 mins drive from Martinborough. We pushed through the Jags already parked outside, and mustered inside for wine tasting. After several agreeable drops, (but deciding not to buy at $50 a bottle)!, we wandered out onto the deck for the formal part of the day; the club meeting. Once again "tin bum" Keith Robinson won two lottery prizes, and so will no doubt be appropriately fined at the next meeting. John Peters was appropriately fined for buying two cars in the states but neither being a Mustang , not to mention arriving at the meeting in a Corvette! Formalities out the way, it was time for a coffee to warm up, then away so as to get home before dark. A very enjoyable day out it was for sure! 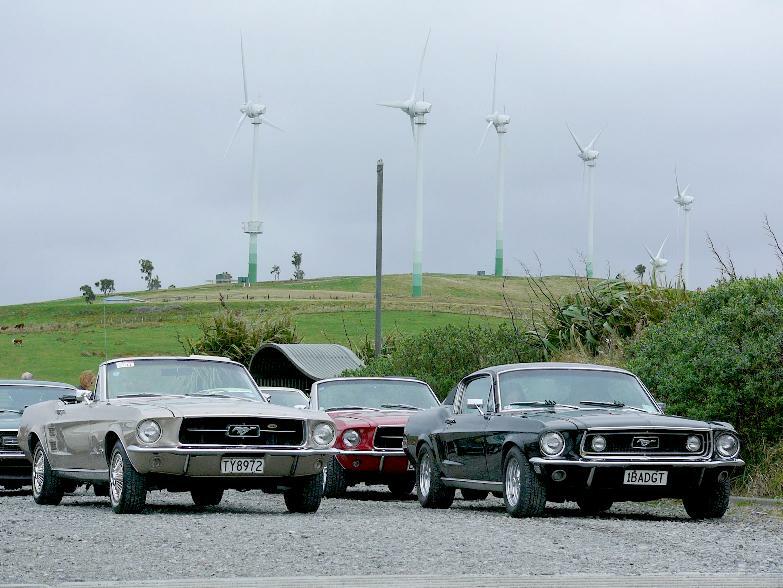 Members chat in the Martinborough square: Mustangs meet wind turbines. This was a weekend event – for the brave – lesser mortals had the choice of just coming on Sunday. On Saturday evening we met at the Criterion Hotel in Bulls for an early meal (fast, cheap and good). The fact that this was the actual date of the Mustang launch 40 years ago had us raising our glasses in a toast to our favourite car. Then we proceeded, with our torches and much trepidation, to the Horror Maze. Amazing Maize Mazes are constructed in cornfields (necessarily having a short life – the corn gets cut down late April/early May) and are absolute works of art. The big maze presents a different picture, when viewed from the air, every year. This year the ‘picture’ was a clown. The R16 night maze is held in a different field – around 1,000 people shriek their way round it each night it’s open, some apparently so shocked they have little accidents. We shrieked a lot but kept control of our bladders (laughing too much was more of a problem). Somewhere between 12 and 20 actors, attired in gory or scary, or both, costumes, like nothing better than to scare the hell out of the paying customers. There were some wonderful set pieces, too; we were particularly impressed with the Vietnam and truck scenes. Surprise is the element most used, and although you know they aren’t allowed to kill or maim you, it’s still nerve-wracking wondering what and when the next fright will be. Biggest (and funniest) reaction came from our President John Camm, who was startled by someone in his own group and fell backwards into the corn. He was hauled out again by a werewolf, who was no doubt expecting to be providing the frights, not rescuing people! Afterwards we calmed down by playing with the ‘toys’ for a while – stilts, four-person ‘skis’, hula hoops and more. On Sunday we went through the big maze – 8 feet high and almost impossible to know where you are (unless you take a map, watch the position of the sun and the shelterbelt trees) and most (I stress, most) of us got through in about an hour. They also have an indoor 3D/fluoro maze which is pretty cool. After lunch the serious business of trying to win the grasskhana began. 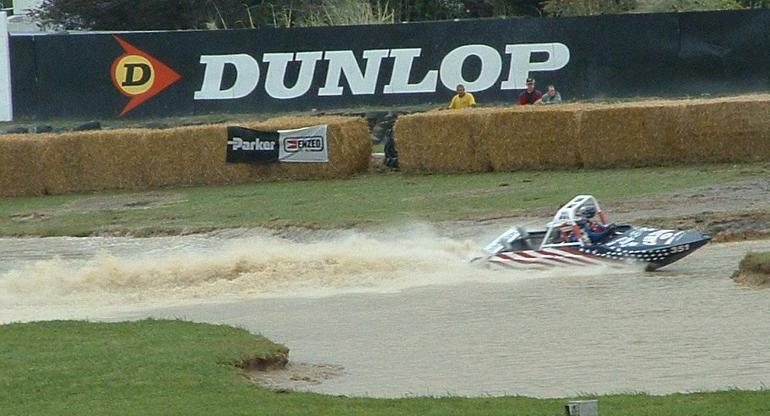 There’s been so much rain this year that the paddock (dusty and dry last time) was damp and very slippery. Took a while to wear down the grass enough to get a small measure of traction. We’d had so much fun in the mazes that we thought we should return the favour to the staff, so a couple of them got to be passengers on a slide around or two. Maze owners Andy and Beth donated a t-shirt to the fastest car and it went very nicely with the trophy won by Kevin Golding, who showed great restraint and car control to come up with the fastest time (since Kevin was driving Debbie’s car we think it only fair that he should give her the t-shirt). Some, however, would rather slide around than win stuff, and that’s okay, too. 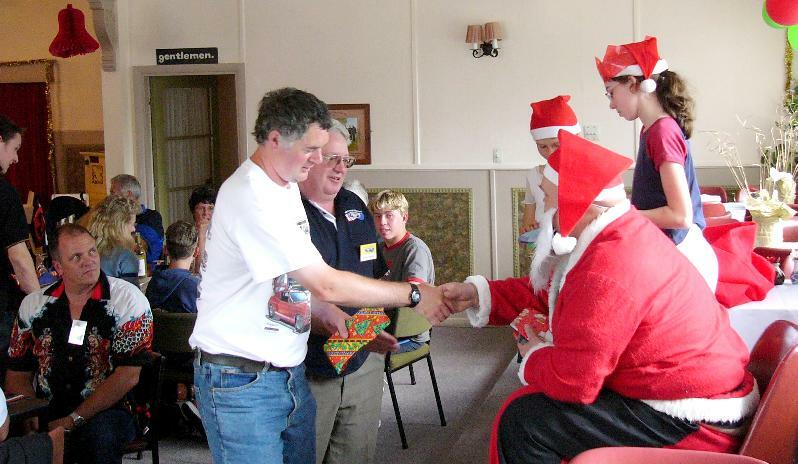 While we were in Wanganui we were invited to attend this event and perhaps provide cars for a drivers’ parade. We didn’t need to be asked twice. There was a great turnout of Mustangs and, in fact, all cars ended up participating in the parade, then parked on the front straight while the racing was on. 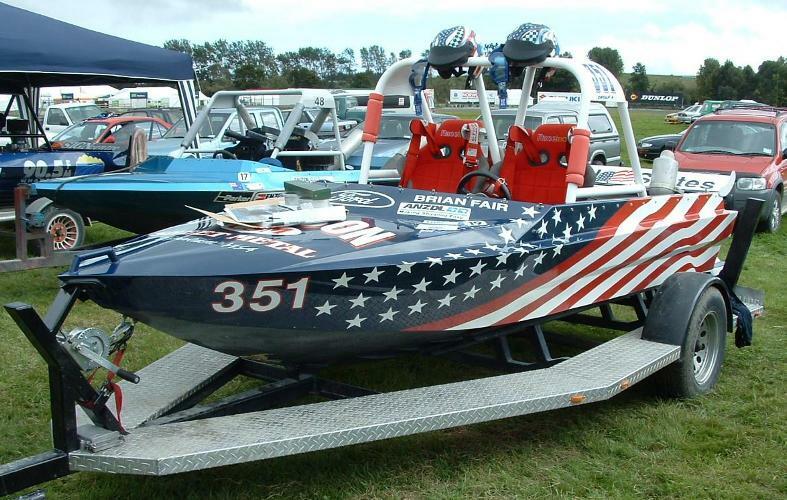 The racing was great – these boats have very powerful engines and go fast and sound great (just what we like), and driving them requires much skill. We were chuffed to be invited, the organisers were pleased with the parade (and there might even have been some overseas TV coverage) and front straight decoration and we all enjoyed the somewhat unusual club meeting. Boat with the number we like; Front straight display. We had planned a cruise, lunch at Foxton Beach then a visit to the excellent Thomson’s Motorbike Museum in Rongotea. We checked that the floods hadn’t washed out the museum and, no, they hadn’t, but the following weekend’s gale force winds had toppled a stand of trees onto the parking area, so we couldn’t go there. 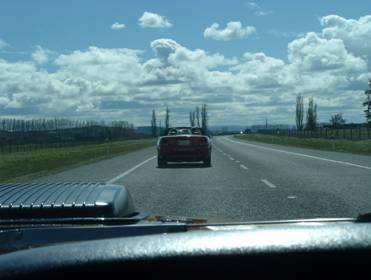 We decided to have the rest of the run anyway and cruised from Levin to Shannon and then to Foxton Beach, on roads many of us had never been on. Flood damage was very much evident and water was still right up to the top of the flood gates we drove over (carefully!). It’s very sobering to see the ruin of so many people’s livelihoods. Simply Balmy Café cheered us up, though, with excellent food at excellent prices, and were not rattled by a number of people arriving at once and what’s worse, not being at their tables when the food was ready. Nothing was too much trouble and we were made very welcome. The weather wasn’t great and no one seemed keen to venture out to the local attractions, so we held a quiz. Bullying, bribing, cheating and the usual misbehaviours did not move the two judges and the Team Speedy Weedy (the name has to do with a club member, a gardener by profession, who copped a speeding ticket on the way to last year’s convention) emerged as clear winners. The January meeting was held to coincide with the Hydroplane Time Trials. We didn’t get to see much of that, as recent torrential rain had filled the river with logs and when the tide changed they all came floating onto the course. Still we saw a couple of runs and then enjoyed strolling and chatting, later repairing to a nearby café (excellent coffee, too. Can’t remember its name but it’s on the riverbank) while our security lady watched the cars. A couple of new Wanganui members joined us – of course, we love it when new members arrive at meetings – cars we haven’t seen before! People who are just as obsessed with Mustangs as we are! The locals were much taken with the sight of a dozen Mustangs (and 1 Corvette - we’re not snobbish and anyway, I guess the club’s Vice-President can bring any car he wants to) and there was a steady stream of people perusing the carpark.